Search of the roots for one people - necessity, for others - extravagance. There are peoples remembering ancestors more of 7 generations (Kazakh people), or tens (Polynesians and ancient Israelites)... Recently I have learned a curious thing: if the person loses touch with ancestors (does not remember them, does not communicate with relatives), he has a corking of veins in legs (varikoznoe expansion), being consequence of blocking of communication with Earth-mother. So, suffering this illness it is possible to advise to recollect more often, just in case, native and to communicate with them. Many cossacks pay steadfast attention of genealogy (and in future I'll explore Yaik cossac families), therefore I shall tell a little about the. I am the radical Ural ("Yaitsky") cossack, Garshins are lots of in the Uralsk region. My grandfather Garshin Konstantin Konstantinovich was lost on war in 1941 near Leningrad. To father then there were 3 years, and till 15 years they with the sister went on station, waited for it. Mum of father Anna Pavlovna Garshina (maiden name Fedjunina) (4.07/21.06.1907-1979) and has not married, grew children and grandsons. It had sisters Agrippina (1906-? ), Natalia (15.08.1913-?) and Favsta/Faina (2.02.1916). All lived in Uralsk. From them I there had cousins and sisters. Their father Fedjunin Pavel Platonovich (1873-3.05.1923) and mum Alexandra Fedjunina (1884-?) left to Uralsk from village Maloe Boldino, Bolshe-Boldinskiy volost (big district), Lukojanskiy uyezd (big district), Nizhniy Novgorod gubernia (province), the Russian Empire. It was by a trade the carpenter, in Uralsk worked as the engineer on service of windmills that has allowed to survive to his family during two cannibalism phases in 20th and 30th years. My father Konstantin Konstantinovich Garshin was born in 1939. He started to work at 14 years of age in Uralsk shipping company. Then he has tried many working trades (he has a half of calendar trade holidays). Last job - the Deputy Director of a sanatorium. A tiler by trade, he was the foreman on construction of buildings of air terminal and railway station of of Uralsk. He had many cross in post-war years when bred was made from bran and mill cake. He is now retired. The grandfather on mother Gvozdetsky Leonty Semyonovich (1892 or 1894-1976) was 13-th child and the unique boy in family "Polish prince" (under family legends). Some time of veins in Zaporozhye and-or near to Poltava. Taken a great interest to marxism, he has torn with his family of nobility and has entered in RSDRP (Russian Social Democratic Trading Party - C.P.S.U in future) before revolution yet. Subsequently his sisters subjected to repression and have sent to Siberia. Probably, the part has left abroad. Family archives of Gvozdetskies there are at my aunt Valentina Sofinoa (mum's sister) in the Taldy-Kurgan area. In 30's years He is a director Bijsk of gold mines on Altai. Has constructed a resort Arasan-dig at Taldy-Kurgan. Was the master on all hands. Before war it is subjected to repression, worked on uranium mines, to armies of Rokossovskiy has passed all war up to Berlin. But three his sons Alexey, Ivan and George Gvozdetskies have combined heads. In 1943 the wife of the grandfather (she for 20 his years was more younger) and my grandmother Evdokia Savelevna Gvozdetskaja (maidens has died. Kobylinskaja or Bel'aeva). To mum then there were 6 years. My mum Galina Leontevna Garshina has lead the childhood in children's home. School and technical school has finished perfectly well. Has two higher educations. Began the land surveyor, a floor of Kazakhstan a roulette has measured, and lake between the Kara-Tjuba and Dzhambejta (Jambeita) local residents have named its name - "Gala-sor" ("sor" is salt lake or salt liquid ground on the Turkic languages). Now the pensioner. Also I have a native sister - Elvira Konstantinovna Stepanova (maiden name Garshina) (9.01.1968). My children - son Jaroslav Igorevich Garshin (14.11.1990) and doughter Alexandra Igorevna Garshina (02.02.1993). Sister's children - Tatyana Valerievna Stepanova (9.01.1985? 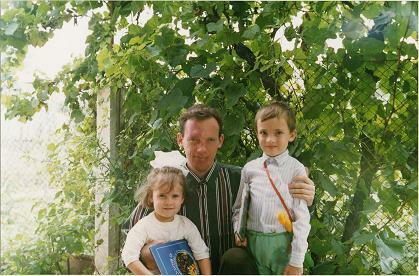 ), Vitaly Valerievich Stepanov (31.10.1989), Kazimir Sergeevich Shevchenko (21.08.2002?). All of us (my family, parents, family of the sister) have moved to 1994 (after disorder of the USSR) from Kazakhstan (Uralsk) to Russia - in a kazak (cossac) village starovelichkovskuju area Kalininskaya of Krasnodar territory. Then I lived and worked 5 years in Moscow (1997-2002), and since February, 2002 - I live and I work in Novorossisk. On a number of data (are in detail resulted below), Garshiny conduct an origin from the Voronezh nobleman Pakhom Garshin, and it - whether from Tatar murzy Garsha moved in the Moscow princedom up to Ivan Grozny (Ivan the Terrible), whether from Gavrila (in popular speech - Garsha). Probably also unity of an origin with Gorshins. For me it is not clear only how nobleman Garshin became cossack Garshin? And it is still not clear, what princes could be in Poland and unless Poles in Zaporozhye Sech could move? But time all so itself I marvel - turns out, that I of a nobiliary origin both on father, and on mother - from kniaz (prince) Gwozdecky (or Gwozd, Ukrainian Gvizd') living in Poland, and then moved in "Zaporozhskaya Sech". To Remote Ages. Sonia Lanskaya. Interview in the weekly "7 days of the Kuban". November, 2004. About finding himselves ancestors and genealogical exploration. [On Russian] Scan-copy of the paper (PDF, 380 Kb). Surnames Garshin, Gorshin, Garanin, Garanichev... Occur from the simplified or diminutive forms of a name Gerasim (in popular speech Garasim): Garsha, Gorsha, Garanja. The name occurs from Greek 'gerasmios' - respectable. Probably, and from Herman, Geronty, etc., but they at Russian were given much less often, than Gerasim. Writer Vsevolod Mihajlovich Garshin recollected: "Under the family legend, our ancestor, murza Gorsha, or Garsha, has left Golden Horde at Ivan III and was christened". The doubtful version: Tatar murza could not carry a Christian name till a christening; Turkic name Gorsha, or Garsha, no. Russian genealogy ascertains: "Garshiny - the ancient Russian nobiliary sort, conducting started from Pahoma Garshina, owning in the Voronezh district since 1632. his posterity is written down by estates in VI part of genealogical books of the Voronezh and Kharkov provinces." The surname is conducted from Garsha - a derivative of a name Gerasim (in popular speech Garasim). Some noblemen of the end of XIX century with this surname. At the end of a line - province and district to which they are attributed. Garshin Leonid Nikolaevich, tts., zemsk. nach. 3 uch.. Zadonsk. The Voronezh province. District Zadonsky. Are brought in the genealogical book. The village Garshino is in Usmanskiy district of the Orenburg area. Named on a surname pioner (first living man). From this village began moving of Garshins on Yaik - nowadays the river Ural. Here they have joined structure Yaik (uralsk and Orenburg) cossacks. Vsevolod Mihajlovich Garshin (1855-1888) - the writer, was born on February, 15, 1855 in village Pereezdnoe, near to Bahmut which now refers to as Artemovsk. From other directory - was born on February, 2 1855 in a manor of the grandmother "the Pleasant Valley", Bahmutovskiy uyezd, Ekaterinoslavsk province. Son of Ekaterina Stepanovna, born Akimova (1828-1897) which has left her husband officer with the tutor of son P.V.Zavadskiy. The husband has declared in police, the search at Zavadsky has led to disclosing of a secret political society. The writer. "Coward" (1879), "Artists" (1879), "the Red flower" (1883), "Signal" (1887) has written stories "Four days" (1877), etc. Has committed suicide on March, 24 1888 in Petersburg. Wife N.M.Zolotilova. Brother Evgenie Mihajlovich (1860-1931) - the writer, the memoirist, the teacher of literature in Gurevich's grammar school and the Foundry female grammar school, director of commercial school of the Simferopol merchant society. For me V.M.Garshin - the master of the psychological story, I name it "mini - Dostoevskiy". I love his many stories, especially about the Crimean war. V.M.Garshin as I understand, belongs to Voronezh branch Garshinyh. When cannot remember my surname, I speak - recollect, who has written "the Frog puteshestvennitsu"? Once even have recollected his other stories. Garshin Vladimir Georgievich, 1887-1956. The pathologist, the professor (1938), academician AMN the USSR (1945). The author of basic researches on aseptic inflammatory growths and metaplasia of epithelial fabrics (epithelium). Vitaly Petrovich Garshin was born on February 8, 1911 in Manchuria, the son of Petr Fyodorovich Garshin and Evgenia Konstantinovna Garshin. In 1929, he graduated from the Gymnasium (Pogranichnaya Obshchestvennaya Gimnaziya) in Harbin with a gold medal. In 1933, he completed studies at the Harbin Orthodox Theological Courses. In September 1935, he is tonsured a monk and given the name: Veniamin. In October 1935, he is ordained a deacon. In May 1937, he graduated from the Construction Engineering Division of the Polytechnic Faculty of St. Vladimir's Institute in Harbin, Manchuria. In January 1938, he is ordained a priest. In 1944, he is awarded the rank of archimandrite. His father died in 1951. In 1956-57, he lived in Japan and served as a priest at Orthodox parishes in Tokyo and Kobe. In April 1957, he arrived with his mother in Sydney, Australia, where he would serve in various parishes. In 1962, he becomes a citizen of Australia. His mother died in 1968. In September 1971, he leaves the jurisdiction of the Russian Orthodox Church Outside of Russia and joins the Orthodox Church in America. For the last 25 years of his life, he was rector of St. Nicholas Russian Orthodox Church in Bankstown (Sydney), Australia. He died on May 28, 1995 and was buried next to his mother. If you have any more questions on Father Veniamin or other historical issues, you may write to me again (even in Russian, if you wish). I will be glad to further assist you. With best wishes, Alexis Liberovsky. Archivist and Director-Department of History and Archives. Executive Secretary - Canonization Commission. As my distant relative from Ulyanovsk writes Evgenie Garshina: "All Garshiny anyhow relatives. On my data us two branches - Voronezh and Ural. All my relatives from Garshinyh live now either in the Orenburg area or in frontier area Samara. All who is in these areas with surname Garshiny appeared my native at conversation. There are people both in Samara and in Orenburg, is and there where I live now - in Ulyanovsk, but only two families and we have each other something like chetvejurodnyh... They too from Orenburg. In Buzulukskiy district of the Orenburg region there is a village with name "Garshino". Similarly there also there lived our ancestors... "
I came across your website today. I speak Ukrainian and Polish and understand some Russian. However, it was very difficult to understand your website with my limited knowledge of Russian. The reason I am writing is because my mother is from the family Garshin. Her name is Tamara Garshin and she was born in Simferopol, Crimea. I have a cousin (Elizaveta Garshin) of that same name who is an eye specialist in Moscow. We are the descendant of the writer V.Garshin. There are other family members who are in Moscow and in California. I have found them through the Internet and have even had a small family re-union. On the V. Garshins side I contacted and met the descendants of his mother (nee Akimova). They live here in NYC and are Americans. So you see, out family has gone through a lot because of the Revolution and the following years of terror. I so hope you can speak English. I forwarded your site to my cousin Katya Shelekhova who is also descendant from one of the Garshin brothers. She is Russian and can speak and write the language fluently. Hope to hear from you in the near future. There is a very simple answer to your question. The Garshins who lived in Crimea and in Ukraine were persecuted by Stalin and his henchman. My whole family was exiled to Siberia (including old aunts who were in their 80's). My grandmother lost her mind there and all she kept on saying is "I am so cold". My Uncle Valentyn G. wound up in a camp where he tried to commit suicide. He lived. After years there and his final release he had to stay in Komi for the rest of his life (as a former prisoner he could not move away). The whole family had the title "Vrag Naroda". My mother herself had a 25 year sentence on her for simply being who she was. She escaped with my father by marrying him when she was only 17 years old. The rest of the family refused to leave although their properties, homes etc. were confiscated. They paid for this stubborness with their lives. Not only is my mother a Garshin descendant on her father's side, her mother was a member of the Kara-Murza family (Karamzin). This was a family secret that was very carefully hidden so that mom as a little child would not open her mouth and say somethng. My mother did not know if anybody survived this Communist Terror. There was not Internet in her generation. I grew up also not knowing any other family members. Only in 1998 by doing research did I find others looking for lost family ties. Right now I am finally finding descendants of the Karamzin family in France. The search for all of you is slow and is taking years. I do it as a hobby because it is important to once again find the remnants of all these families that have been so brutally torn apart and scattered all over the world. My full name is Hanna not Anna. That's where the Hania comes from. Sure, you can put whatever part of my letter you want on your website. Sorry but I have never heard the Gvozdetsky name before I read your website. I will look it up though. The Garshins are a very proud and stubborn family. These are specific characteristics that seem to dominate. They are very intellectual and excel in arts and sciences. They are not always very easy to get along with. Surname Gvozdetsky - Polish, enters into one jack with Russian surname Gvozdev. The surname could be formed from a nickname or a wordly name the Nail, probably it gave the high person or the owner of firm character. Gvozdarev - from names of trades, "gvozdar'" - the smith making nails. But in olden time by "gvozdar" called and managing drinks in an imperial palace, from a nail in a flank (phylologist Dal'). The surname ancient, is mentioned in "Onomastikona" Veselovskiy: the Nail, Gvozdevs: Dmitry Semenovich Gvozd Zaborovsky, first half XVI century; kn. Feodor Dmitrievich Gvozd Priimkov-Rostovsky, the beginning of XVI century; Nail Antonovich Domozhirov, 1570; Gvozdevs, XVI-XVII centuries, Tula and Ryazan. Surnames Gvozdarev and others on the All-Russia family tree. Gvozdev, Gvozdevich, Gvozdetsky, Carnations, Gvozdikov, Gvozdin, Gvozditsky, Gvozdkov, Gvozdover, Gvozdjuk. All over again all Gvozdetskies (native my mums) lived in the Taldy-Kurgan area and in Frunze city (nowadays Bishkek). Then "crawled" across Russia and far. My cousin Olga Gvozdetskaja (maidens.) has left with daughters for Germany. Others Gvozdetskie - on Altai (the sister of mum), the Far East (the sister of mum), Taldy-Kurgan (the sister of mum) and Bishkek (the brother of mum Gennady Leonidovich Gvozdetsky), near Tula (my cousin Alexander Gennadievich Gvozdetsky). Residing Gvozdetskies (descendants of sisters of my grandfather Leontij) at Siberia and in Urals Mountains is supposed also - if they were not all killed (repressed). - His daughter - Gvozdetskaja Julia Andreevna, Moscow, 1985. Gvozdetskij N.A. - the professor-geographer from the Moscow State University. Gvozdetskaja Marina Aleksandrovna - Ural regional management "Goskompechati" (Ekaterinburg). Regions: Kurgan, Orenburg, Perm, Sverdlovsk, Tyumen, Chelyabinsk areas, Komi-Permjatsky, Khanty-Mansi, Yamal-Nenets autonomous districts. (1999). Gvozdetsky Dmitry Leontyevich - 1975 of a birth on July, 31 Moscow Mail (January 2000). Yahoo! Search Result of Gwozdecky There many links on Mark Gwozdecky and George Gwozdecky in USA. Surname Fedjunin enters into one jack with Feodor's surname. It is a patronymic from man's church name Feodor (other - grech. Theodoros - " gift of gods "). In XVI-XVII centuries it was one of the most widespread names at Russian which conceded in frequency of the use only to Ivan and Vasily. In a daily pronunciation the combination of vowels unusual for Russian [eo] has disappeared. Most frequently Feodor's surname meets in the Novgorod and Pskov areas where takes the fourth place among other, and, for example, on the average the Volga region - much less often. From derivative dialect forms of a name there were also other forms of surnames. In other forms there came this name in Russian from other languages, for example: Polish Teodor, Bulgarian Todor. A sound alien to old russian language [f] transferred as [h] or [hv] - Hodor, Hvedor. From these, and also a plenty of colloquial forms of a name Feodor, there were tens surnames: Fedin, Fedonin, Fedoreev, Fedykin, Fedkin, Fedkunov, Fedjunin, Fedjaev, Fedjakin, Fedjanin, Fedjahin, Fedjashin, Fedjashkin, Hodorov, Todorov and many others. Surnames on-eo/uo were given in Siberia: Fedorovyh. Also in Siberia Fedorovsky (ukr. The form) could become Fedorovskih. Fedorovsky, Fedoriv, Fedchenko, Fedorenko, Fedchun, Fedorosjuk, Fedorozjuk, Fedko, Fedoruk - the Ukrainian surnames from the same name. The most widespread suffix in the Ukrainian surnames - enko, a suffix of willows,-iae? meet very seldom, a suffix-oe/?e are characteristic for the western areas of Ukraine. Fedorovskih, Federjakin Fedeshov, Fedoriv, Fedorosjuk, Fedorozjuk, Fedorjaka, Fedko, Fedjunov, Fedjainov, Fedyna. Surnames on-aiei, willows,-oe,-uia Ukrainian. Fedorovich, Fedorkevich, Fedchenok, Fedrinchik - Belarus. Surnames Fedynsky and others on the All-Russia family tree. Fedko, Fedkovich, Fedjuk, Fedjukin, Fedjunin, Fedjuninsky, Fedjunkov, Fedjushin, Fedjushchenko, Fedjaev, Fedjainov, Fedjakin, Fedjakov, Fedjanin, Fedjashin. Fedjunina Nina Nikolaevna - 04.07.1950, Lipetsk region. Daughter of Nikolay Petrovich and Aleksandra Ivanovna. By formation the engineer rate-fixer. Husband Svechnikov Vladimir Klavdievich, 1948. Igor Garshin Site, 2002. Write the letter (Igor Garshin's"> ).